"It’s a wonderful life for the 1% and a Xanax existence for the 99," Bill Gross says, bemoaning the pacification of the masses that the (former) bond king likens to "a day at the Coliseum" for Plebian citizens and "cake" for the French Bourgeoisie. Meanwhile, manipulate prices of interest rates and stocks to benefit corporations and the wealthy while they feast on exorbitantly priced gluten-free pasta and range-free chicken at Whole Foods, or if even more fortunate, pursue high rise New York condos and private jets at Teterboro. It’s a wonderful life for the 1% and a Xanax existence for the 99. But who’s looking – or counting – even at the ballot box. November 2016 will not change a thing – 8 years of Hillary or 8 years of a non-Hillary. Same difference. Central bankers, Superpacs, and K street lobbyists are in control. Instead of cake, the 49.5% (males) will just have to chomp on their Carl’s Jr. hamburger and dream of a night with 23-year-old Kate Upton lookalikes that show them how to eat it during Super Bowl commercials. And if that’s too sexist, then Carl’s is substituting six-pack hunks instead of full-breasted models to appease the other 49.5% (females). 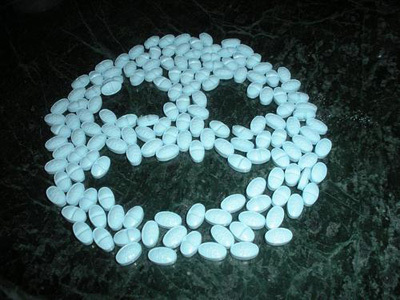 It’s a Xanax society. We love it. But I kid my readers – (that’s what comedians say on TV when they approach an edge). Kidding aside, however, if the 99 think they’ve got it good (bad) now, just wait 10 or 20 more years until their bills really come due. Of course by then, the 1% likely won’t be doing so well either, but there’s the hope that each and every one of them (us/me) can sell before the deluge. I speak specifically though to liabilities associated with the Boomer generation: healthcare, private pensions, Social Security and the unestimable costs of global warming, but let me leave the warming of the planet out of it for now. Let me try to convince you with some hard, cold facts, many of which are U.S. oriented but which apply as well to much of the developed world, because we’re mostly all getting older together. Demography rules. Explaining this demographic countdown requires an impolitic concession that the world’s population is gradually aging, some at a faster rate than others (Japan, Italy, Taiwan!) but mostly in developed vs. undeveloped countries. And it is the elderly that require more services and expenses than newborns, although at first blush it would seem that an infant in diapers requires more attention and healthcare than a 70-year-old retiree. Not really. To focus on some U.S. centric mathematical realities, several years ago Mary Meeker in a 500 page, softbound edition entitled “USA Inc.” put together a series of U.S. Treasury and other government reports that outlined just how dire America’s future demographic is in terms of financial liabilities. It is one thing to put readers to sleep with a 2030 forecast for aging boomers, as shown in Chart 1 but another to use the government’s own present value of these debts as of 2016. If financial market observers seem aghast at current Greek or Puerto Rican debt traps, they would surely take a double dose of Xanax when confronted with this: Fact – The U.S. government has current outstanding debt of approximately $16 Trillion or close to 100% GDP. The present value, however of Medicaid ($35 trillion), Medicare ($23 trillion), and Social Security ($8 trillion) promised under existing program totals $66 trillion or another 400% of GDP. We are broke and don’t even know it, or to return to my opening analogy, we are having our cake, eating it at the same time and believing that a new cellphone app will be invented in the near future to magically deliver more of the same. Not gonna happen folks. Some politicians like Paul Ryan who argue for balanced fiscal budgets are intelligent sounding but relatively clueless. “Austerity – if not now, then when?”, he would argue in Reaganesque twitter. “Let’s slow down or even stop the inexorable clicking of the debt clock: 16 trillion, 17 trillion, 18 trillion”…he would add. Well yes, every little bit helps, Mr. Ryan, but the fact of the matter is (a great political phrase, is it not?) 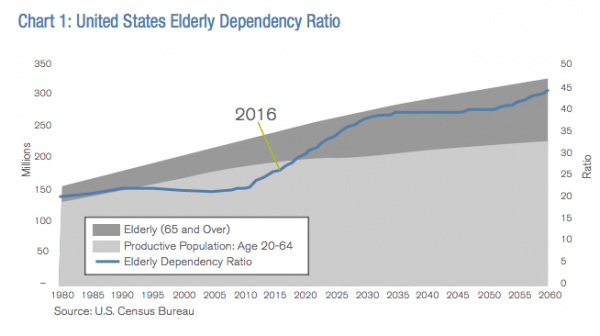 that reducing the growth rate of current government debt does little to help what in essence is a demographic not a financial problem: too few Millennials to take care of too many Boomers. Social Security “lock boxes” or Medicare/Medicaid “trust funds” which in essence represent “pre-funded” liability systems, cannot correct this demographic imbalance, because financial assets represent a “call” on future production. If that production could possibly be saved like squirrels ferreting away nuts for a long winter, then Treasury bonds or purchasing corporate stocks might make some sense. But they can’t. Future healthcare for Boomer seniors can only be provided by today’s Millennials and even doctors yet to be born. We cannot store their energy today for some future rainy day. Nor can we save food, transportation or entertainment for anything more than a few years forward. Each of those must be provided by a future generation of workers for the use of retired Boomers. And as Chart 1 points out, the ratio of retirees to workers – the dependency ratio – soars from 25 retirees for every worker to 35 over the next 10 years or so. There’s your problem, and neither privatization nor any goodly number of government bonds deposited in the Social Security “lock box” can solve it. While these paper assets may “pay” for goods and services, their value will be market adjusted in future years to exactly match the quantity of things we buy, and that quantity will be substantially a function of the available workforce and the price they command for their services. This is another way of saying that the value of Treasury bonds and even private pension held stocks will be marked down in price as they are sold to pay for future goods and services, and that the price of these goods and services will be marked up (inflation) to justify their reduced demographic supply. Productivity gains are often advanced as a solution but productivity gains have been shrinking in recent years, and even so, employed workers cannot be expected to hand over future advances to retirees without a fight. Having more babies would also turn the trick, but at the moment, making fewer seems to be the going trend. Investment implications? Well it is true that if much of the developing world is younger demographically (think India), then developed nations could and should transfer an increasing percentage of their financial assets to emerging markets to help foot the demographic bills back home. Long-term then, as opposed to currently, think about increasing your asset allocation to the developing world. It’s also commonsensical that if higher Millennial wages are the probable result of a shortage of healthcare workers relative to Boomer requirements, then an investor should go long inflation and short fixed coupons. U.S. 10-year TIPS at 80 basis points seem like a good hedge in that regard. And of course in terms of specific equity sectors, healthcare should thrive, while liability handcuffed financial corporations such as insurance companies as well as the bonds of underfunded cities and states such as Chicago and Illinois, should not. Other countries have similar burdens. The Financial Times reports that the UK pension industry faces a 20-year wait until they might have enough cash to meet their liabilities in 2036. Until then, they cannot. In general, it seems demographically commonsensical that Boomers have in part been responsible for asset appreciation during the heyday of their productive years and that now, drip by drip, year by year, they will need to sell those assets to someone or some country in order to pay their own bills. Asset returns will therefore be lower than historical norms, especially because interest rates are close to 0% in developed countries. Demographics may not rule absolutely, but they likely will dominate investment markets and returns for the next few decades until the Boomer phenomena fades away. The 1% – in addition to the 99 – will need extra doses of Xanax, or additional slices of cake, to cope in the next few decades. Let the games begin.